This Short Update describes events occurring in Bu Tho Township, Hpapun District, in May and June 2015, including maiming due to a landmine explosion, forced labour, and military activities. Saw A---, a 40-year-old villager from B--- village, Hkaw Poo village tract, Bu Tho Township, stepped on a landmine reportedly planted by the KNU between Y--- forest and Z--- forest while he was hunting on May 16th 2015. He was subsequently hospitalised and had his leg amputated. On June 12th 2015, a group of Border Guard Force (BGF) soldiers from Battalion #1014 ordered the villagers of C--- village, Meh Pree village tract, Bu Tho Township, to help them with general camp support such as carrying water and collecting vegetables and firewood. Thirty-five Tatmadaw soldiers from Light Infantry Division (LID) #22 and two other BGF soldiers came into D--- village, Kyaw Pah village tract, Bu Tho Township, on June 14th 2015. They were carrying heavy weapons with them while crossing the KNLA delimited territory to show off their presence, since they heard there was a Karen armed groups meeting taking place at the time in E--- village. The following Short Update was received by KHRG in June 2015. It was written by a community member in Hpapun District who has been trained by KHRG to monitor local human rights conditions. It is presented below translated exactly as originally written, save for minor edits for clarity and security. 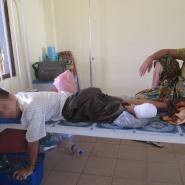 When he was first injured by the landmine, people did not dare to go and get him [from the location where he was injured]. Later on he was taken to Hpapun [Ka Tin Ta Ya] Hospital at 6 pm and he arrived at Hpapun Ka Tin Ta Ya Hospital [shortly] after 11 pm. His leg was amputated at 1 am in the morning on Monday. When he was taken to the hospital there were 20 villagers who accompanied him to the hospital. In the evening, after his leg was amputated, the Burmese [Tatmadaw] soldiers came to him and brought him some juice and snacks in a hand basket and they said, “That was not our landmine, if it were our landmine you’d already be dead.” I also asked Saw F---’s [Saw A---’s] wife and she said that it was a KNU [Karen National Union] landmine. She also said that she heard two other landmines had exploded after her husband was injured. She told me that another six landmines have been planted, as well. I asked her why and she replied that she doesn’t know. He [Saw A---] went to somewhere between Y--- [forest] and Z--- [forest] with a gun for [the purpose of] hunting and he still remembers that when he was injured, he was bleeding and his dog was licking his blood. Beside the location where he got injured by the landmine there is a road that Burmese [Tatmadaw] soldiers travel [on frequently]. There is a mountain and a valley between the road and the place where the landmine was planted and [he] did not know who planted the landmine. He [Saw A---] said he was injured by the landmine because he did not know the landmine was there. I questioned him on June 6th 2015, in the evening, at 4:30 pm, and he was saying that he has been staying in the hospital for [the past] three weeks. Currently, he is still in Ka Tin Ta Ya hospital. It was his left leg that was injured by the landmine. I met with villagers from C--- village and the villagers told me about forced labour ordered by the BGF [Border Guard Force]. On June 12th 2015, a group of BGF soldiers [led by code name] Plah Thoo [Company Second-in-command Moe Hein] and Plah Yu Say, under BGF Battalion #1014 ordered the villagers from C--- village, Meh Pree village tract, Bu Tho Township, Hpapun District, to go and work (carry water, find vegetables and firewood) for them in their camp. Five villagers had to go and work in the camp for three days and then another five villagers had to replace them after three days. The BGF did not give any money to the villagers [for their labour]. [Some] villagers had to hire people to go and work [in their stead] if they were not free and they had to pay the villagers [they hired] 5,000 kyat (US $4.28) per day. On June 15th 2015, many KNLA [Karen National Liberation Army] soldiers were [seen] coming into G--- village, Meh Pree village tract, Bu Tho Township, Hpapun District, and the villagers were frightened because they worried that fighting would happen between the KNLA and the BGF. Therefore, they ran into their bomb shelter. Then [later that day], the BGF came into the village and pointed at the villagers with guns and asked why they ran to hide in the bomb shelter and told them to come out. The BGF soldiers were led by Plah Thoo, under Battalion #1014. On June 14th 2015, the Tatmadaw soldiers from LID [Light Infantry Division] #22 came into D--- village, Kyaw Pah village tract, Bu Tho Township, Hpapun District. There were 35 Tatmadaw soldiers and two BGF soldiers, 37 soldiers altogether, and they also brought heavy weapons with them. They also crossed [into] the [KNLA] delimited area. They did it because they heard that the Karen armed groups were holding a meeting in E--- [village and they wanted to demonstrate their presence]. Code names in this report refer to the aliases soldiers use over their radios (walkie-talkies). Plah Yu Say is also a radio (walkie-talkie) code name, however KHRG was unable to determine the real identity of this particular soldier, who is serving under Company Second-in-command Moe Hein. All conversion estimates for the kyat in this report are based on the July 31st 2015 official market rate of 1,167 kyat to the US $1. This incident was previously reported by KHRG in a News Bulletin, see. “BGF Battalion #1014 demands forced labour, asserts heavily militarised presence in villages in Hpapun District, June 2015,” KHRG, December 2015. Saw F--- is the alias of Saw A---, the villager who stepped on the landmine.